A rivalry steeped in history. Watch two of Italy's most prolific goalscorers as Roma's Edin Dzeko and Juve's Cristiano Ronaldo go head to head. Watch AS Roma v Juventus from seats of your choice! Add Stadium Tours, see the Colosseum and much more! 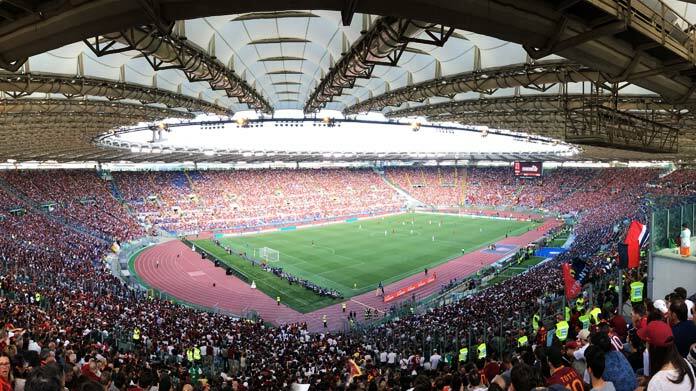 The Stadio Olimpico has a capacity of 70,634 and has been the home of SS Lazio and AS Roma since 1953. Rated highly by UEFA and FIFA alike, it has played host to the World Cup Final in 1990 and has hosted four European finals, with the most recent of which being the UEFA Champions League Final in 2009. Its cauldron like shape helps to contain the atmosphere created by the home team's Curva section. Rome is the Capital of Italy, situated in the south of the country, this cosmopolitan city is sprawling with ancient ruins from the Roman Empire which once ruled over the city and beyond, with the Colosseum and Vatican City providing two of the many focal points of interest within this historic landscape. Rome is high on the check list for many a traveller. The Colosseum is the largest amphitheatre ever built. Used for gladiatorial and other various public spectacles, it was constructed in the year AD 72 by the then emperor Vespasian. Its is listed as one of the new seven wonders of the world and is still seen as an iconic symbol of Rome, with it also being showcased on the five-cent euro coin. Rome is a city which is well served by public transport, with a travel ticket that is valid for bus, metro and trams available at the excellent price of just 1.50 euros, this ticket lasts for 100 minutes. Alternatively, travellers who are staying within the city for a longer period of time can purchase a 7-day ticket which costs 24 euros.